It is appropriate that the word tsunami, which means a “harbor wave” caused by a large displacement of water, is of Japanese origin. ­The island-nation, situated precariously in the active region known as the Pacific Ring of Fire, averages one tsunami every 6.73 years, the highest average in the world (The deadliest tsunami, however, occurred in Portugal, which lost up to 100,000 people in the aftermath of the 1755 Lisbon Earthquake. The tragedy sparked a fierce debate between Voltaire, who condemned God for visiting such death and destruction on innocent people – the earthquake happened on the morning of All Saints' Day when the churches were packed – and Jean-Jacques Rousseau, who argued that mankind was partially responsible for the high death toll because he built his structures so high). November 29, 684 AD is the first officially recorded tsunami to hit Japan following the Great Hakuho Earthquake, which was about the same magnitude as this month’s 8.9 tremor to hit the island-nation of 127 million people. But that is where the similarities end, it seems. There are stark differences between these two natural events, differences that pose tremendous, yet largely ignored challenges for modern civilization, if not life itself. 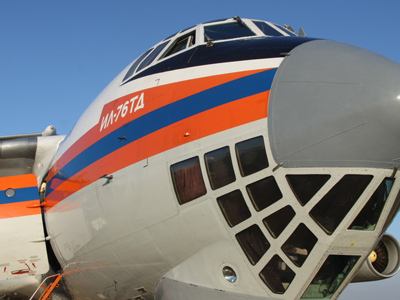 First, the disaster of 684 was largely a local event with local consequences. The earthquake crumbled buildings, flattened entire villages, while churning up one of those massive waves that have prompted various legends (the most popular, perhaps, is that a deity is responsible for holding down a foundation stone (kaname-ishi) on top of a dragon-like catfish (namazu) that lives in the Pacific Ocean; occasionally, the large serpent is able to wiggle free from his captor, thus triggering the massive quakes and ensuing tidal waves with his thrashing). 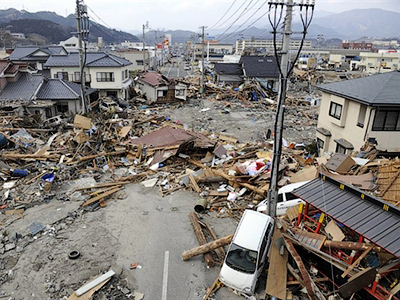 Like the tsunami that struck last week, tens of thousands of people were victimized by the catastrophic event of 684. By comparison, the Japanese earthquake-tsunami of 2011, which was powerful enough to expand Japan’s coastline in some places, is turning into a tragedy of both local and global dimensions, which may be another byproduct of globalization: the global impact of "local" catastrophes. In addition to the thousands of people who perished in the earthquake and flood waters, there are extreme hazards involving the affected infrastructure. 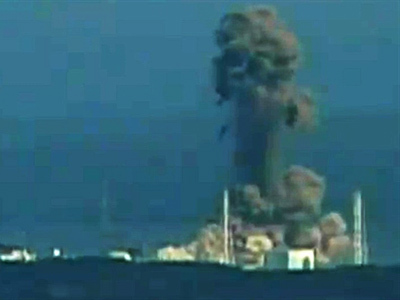 Four Japanese nuclear power plants have reported extensive damage, while the most critical situation is at the Fukushima Daiichi nuclear plant, which was hit by explosions at the weekend. Reactors there are threatening to overheat while traces of leaked radiation have already been detected as far away as Tokyo. This is a nightmare consequence of a natural disaster that the people of the 684 catastrophe could not have imagined. And radioactive contamination, as the Chernobyl disaster proved, is not a local event. Second, the total amount of waste, chemicals and debris that Japan’s “natural disaster” has unleashed into the environment is beyond estimation. 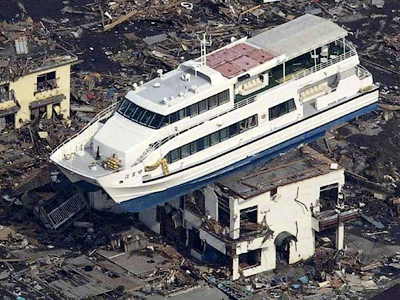 However, judging by the “surreal” images now available, with large ships sitting astride homes, and automobiles and homes washing away like toys, Japan faces a cleanup effort that may never end. This underscores the stark differences between the disasters of 684 and 2011. The millions of gallons of pesticides, chemicals, oil-based products, for example, released into the water and air around Japan is no isolated event, but will have a global impact that is impossible to predict (In this context, it is important to remember that man-made accidents, such as the massive BP oil spill that practically killed the Gulf of Mexico, can happen anytime, anywhere). Third, how many people viewing the incredible physical devastation asked themselves the question: where in the heck is all of that debris going to go? Although it may seem like a question of minor importance, especially in light of the human death toll, it is becoming one of the most worrisome problems of our mass-production societies: where are we going to put all of our rapidly accumulating rubbish? Most landfills are already operating at full capacity, while recycling eliminates just a fraction of the waste (while, ironically, also contributing its own amount of waste, or entropy, due to the earth's closed system; humans have yet to escape the inescapable Second Law of Thermodynamics). Meanwhile, we all want the best of both worlds: the freedom to toss out refuse at will, while holding firm to the matra: "Not in my backyard" when it comes time to create yet another garbage dump. In other words, we are demanding the impossible of Mother Nature: it must perform as both Garden of Eden, and a waste dump at the same time. And only when "natural disasters" like the Japanese earthquake-tsunami strike do we come face-to-face with the uncomfortable realization that our modern way of living is unsustainable to a ridiculous degree. Since the Earth is a finite place (as opposed to infinite), there are very definite limits to how much space we have for disposing of our rubbish, not to mention all of the chemicals, pollutants and other by-products of our world-wide consumer society. If the world was an infinite place, with no end to the frontier, there would be no cause for concern. All of the dangerous byproducts of our consumer society would magically wash “down the drain,” so to speak. Alas, it may be the tragedy of man’s existence that he was forced to live on a limited landscape, which does not seem large enough to contain his tremendous gifts and ambitions. Now, when you take all of these factors into account, the question becomes rather obvious, at least for those who stopped deceiving themselves long ago: how many natural disasters can the human race, addicted as it is to modern conveniences of every variety, survive? Indeed, in light of the tremendous pressure that humans exert on the planet, it is difficult to say what the earth, not to mention the human race, will look like in a mere half a century. Although modern technology has proudly delivered us an amazing assortment of super-sophisticated appliances and devices, including early-warning detection systems to predict the arrival of natural disasters, including tsunamis, as well as “earthquake-proof” buildings from where we can watch the devastation unfold with video recorder and Twitter in hand, it has also burdened our small planet with physical and chemical products – from automobiles to nuclear reactors to weapons of war – that pollute our ecosystem in ways that are beginning to alter weather patterns, ecosystems and the entire face of the planet. So when a massive amount of physical and chemical waste suddenly gets dumped into our life-giving waters and oceans as some unpredictable “act of God,” then it is not just Japan that has to deal with a dragon of epic proportions; it is the entire planet. Destructive "acts of God," as bad as they are, are nothing compared to destructive “act of Man.” And presently it seems that only man is in the position to save himself from this ultimate paradox. Unfortunately, time does not seem to be on our side.